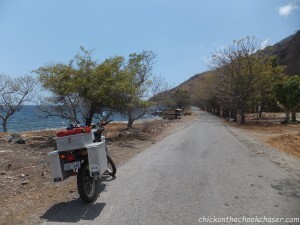 For most people an ordinary Thursday morning, for me the start of exploring East Timor on my own bike. The warm wind touches the parts of my face not covered by my helmet and dust mask. Left of me, the turquoise and deep blue colours of the endless sea. Right of me, the red and brown of the mountains at the end of the dry season. Ahead of me many kilometres of coastal road, interspersed with villages, consisting of a few huts, every now and then. I feel free. Bike riding requires you to keep your hands on the handlebars but I’d like to open my arms, throw my head back and yell out my biggest, deepest woohooo and yiiihaaa. This is it, this is the beauty of the unknown, this is what all the paperwork and preparations are for. 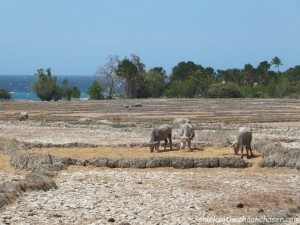 As the coastal road turns inlands there is the second city of East Timor, Baucau. I quickly fill up the tank with fuel and myself with water and try to figure out how long it is to Com, a fishermen’s village at most eastern end of the coastal road. After asking 7 people, with varying ability to communicate in English, the average travel time seems to be 3.5 hours ( 6 at the worst, 2 at the best…). Since it’s only just after lunch time Com should be within reach for today. The road got worse past Baucau, first perfectly seeled, then gravel with potholes, then perfectly seeled again, potholes and gravel, etc. Sometimes I had to slow down to avoid the goats and buffaloes crossing the road, but altogether it was a very pleasant ride and Com was reached in about 3 hours. 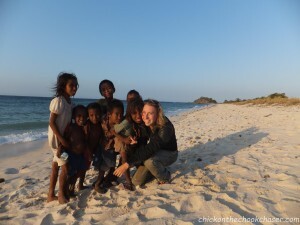 Found a place to stay and eat and was accompanied by the entire primary school population during a walk on the beach. Such a lovely place! 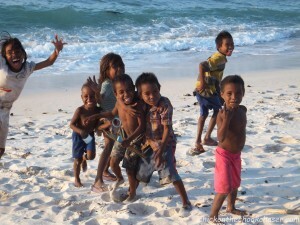 The next day I set off to Jaco Island. There is a shortcut from Com to Tutuala. Part of which wasn’t on my map… It later appeared that gravel roads aren’t on the map, but the road, all be it gravel was fine. 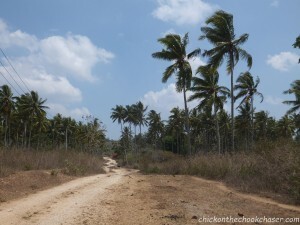 In Tutuala there is an 8 km, very rough road to Jaco Island. Multiple people had warned me it would be a challenge to do on the bike. I checked in with the locals, they all seemed to share the same opinion. I would be fine taking the bike on that road. So I did. The first kilometre was fine, rocky, but fine. Then I reached a stretch where the road had totally fallen apart, big holes and boulders was all that was left. The heavy loaded bike was bouncing and making a high pitched yelling noise in first gear. Then I couldn’t control it anymore, as I was going uphill I came to a near stop and the bike found stability down on its right side. Oops! This wasn’t the plan! A local guy came out to help getting it upright again. Calming my trembling hands I got back on to continue the journey. About 500 meter later I stopped, walked, removed some rocks and rode through a very tricky part. Happy with the achievement I bounced further up, until a 30 cm difference in height of the road stopped me and I found the bike back on its right side. That’s it, I wasn’t going to ruin the chook chaser on this rock slide! Five minutes later another local guy came past, helped me get the bike up again and tried to convince me I should ride with him to the island. No way I gestured 10 times in my best sign language (he didn’t speak a word of English or Indonesian). 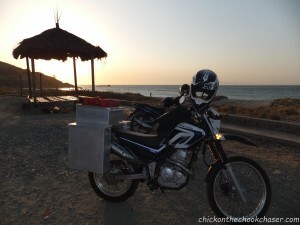 I ended up leaving the bike at the last hut along the road. The people put my bike gear in their little hut. A hut with only 1 plastic chair and a tv, and now also my helmet, jacket and drybag. After saying thank you at least 10 times I set off to walk the remaining 6 km to the beach. In these 6 km the conditions of the road didn’t improve at all, reassuring me that leaving the bike behind was a good decision. 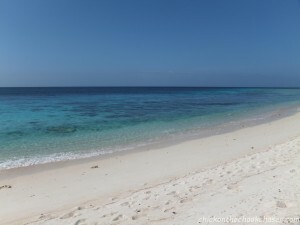 Arrived at the beach a fisherman took me across the narrow straight separating Jaco Island from the main land. 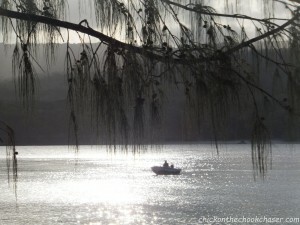 When I arrived, there was no one on Jaco Island. Just me, myself and I. The beach was whiter than white, and the underwater world amazing. I would have walked another 6 km for this if I had to! 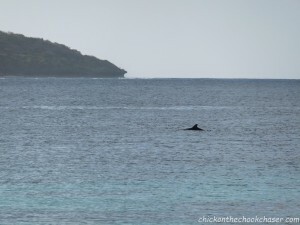 While relaxing on the beach a group of dolphins cruised past, showing their fins just above the water. It couldn’t have been more perfect! Ik ben Jozien ,je moeder schildert bij mij en sinds zij mij een link naar jou blog heeft gemaild lees ik met bewondering jou prachtige verhalen. Wat een belevenis zo ver van huis .Samen met je moeder praten we er over en dat is ook voor haar fijn. Geniet maar lekker van je vrijheid en alles wat je beleefd en ziet. Ik blijf in ieder geval je verhalen lezen en daar geniet ik dan weer van. Groetjes en hou je goed. Wat leuk om te horen dat je van mijn verhalen geniet! Het is geweldig dat ik op deze manier mensen kan bereiken die ik niet eens persoonlijk ken. Voor mama is het niet altijd even makkelijk dat ik aan de andere kant van de wereld zit. Dus om te horen dat jullie haar daarin steunen vind ik heel fijn. Bedankt en blijf van mijn avonturen genieten!